This BMG-RCA bargain box is part of the Complete Collection series. The set was first issued in 1994. It is highly recommendable. We probably know our Rozhdestvensky, our Svetlanov and our Kondrashin. Those who have collected Arkadia, Arlecchino and Boheme will also know of the galvanic Golovanov whose liberty-taking easily outstrips Stokowski. Even so Golovanov remains something of a mystery man. What about the rest? Edward Serov records for Kontrapunkt and Northern Lights. Sinaisky has done some excellent Sibelius (Saison Russe) and Szymanowski (Chandos).Vladimir Ponkin has had several recordings on Saison Russe including a fine disc of Prokofiev�s theatre music. When in the 1970s EMI-Melodiya were haphazardly producing their Glazunov symphonies two conductors Fedoseyev and Ivanov became known. Fedoseyev even recorded all eight and these were issued on a box of Eurodisc LPs - still absent from the CD lists. Much of his recorded activity on Melodiya has been reissued on the Swiss Relief label courtesy of producer Urs Weber - although not the Glazunov. Yuri Temirkanov was in much the same category as Fedoseyev although his EMI-Melodiya LPs were few and far between. The Soviets allowed both to tour outside the USSR but the impact they made was limited. The reception accorded their recordings was muted by comparison with figures such as Mravinsky, Rozhdestvensky and Kondrashin. With this in the background the present bargain price set comes as something of a surprise. Temirkanov allows himself a great deal of license in the interpretative steer he gives to these well loved scores. His mercurial stormy spirit gives each work the feeling of a performance made anew. 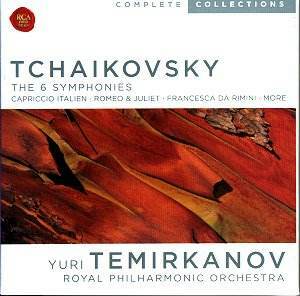 Temirkanov is a master of the well-judged accelerando and decelerando. The elasticity of response and the romping power reminds me of the headstrong wilfulness of none other than Golovanov whose Arlecchino CD of the Rachmaninov Third makes fascinating listening whipping up a headstrong emotional storm. I started with a personal favourite: the Fourth Symphony. The start bodes well with the horns goaded to raucous hoarseness in the first movement (8.12). Wildness is not everything: the grace of the flute is most touchingly done in the second movement. As for recording quality this can be judged from the lusty glowing reverberant sound evident from the delectable pizzicato capers of the third movement. Temirkanov builds and releases genuine excitement here. The finale pumps out a real blast of sound and there is a lightning-bolt impetuosity about the experience. It is not quite as headlong or breathless as the classic 1961 DG recording of Mravinsky with the Leningrad Philharmonic. However it is impressive and allows the listener more of a chance to draw breath than Mravinsky ever did. Given Sakari Oramo�s recent Sibelius Sixth it would be interesting to hear his version of the Tchaikovsky Fourth. I suspect that it would not be a million miles from Temirkanov�s. Temirkanov�s Fate or Fatum is given a strongly Elgarian splash at the start and this returns at 11.03. There is a raucous melodrama about this as it careers close to Borodin�s Second Symphony. At 6.43 we hear that peculiar brand of Tchaikovskian heart�s-ease and from 9.48 onwards there is a similarity to the strenuous moments from Manfred (and what a pity that there is no Manfred here - he might well have trounced or at least equalled Svetlanov). The work�s weaknesses begin to become evident in the ramshackle and gloom filled attitudinising of the final pages. This was a work destroyed by the composer after criticism from Balakirev. It survived through a reconstruction from the surviving orchestral parts. The Fifth Symphony again shows individuality. The �sticky� phrasing, the hesitations and accelerations, the micro-scale pressings forward and holdings back, all are expertly judged. For Temirkanov there is no question of following the care-worn orthodoxy of the conventional line on the Fifth. The recording smiles on the brass who shine momentously. The finale is tenderly expressed and the presto while not taken at the withering speed of the Mravinsky recording (DG) has perhaps more loving kindness about it. Temirkanov's temperament is not as remorseless as that of the stern Mravinsky. This is a version of the Fifth to re-engage the listener although if you want a great recording I would not part company with the revelatory Vanguard recording of the LSO and Monteux in Vienna in the early 1960s. What of the Pathétique. There are moments when it is just over the top. Temirkanov takes the first movement at times preternaturally slowly although this does pay dividends in the lunging lightning contrasts of speed. At 10.30 the music thunders and stabs viciously. The pace is devil-take-the-hindmost. This is not all adrenaline rush. The strings are leant a starry radiance by the acoustic and the engineers. The march struts in vainglory at 6.04. The agreeably distended finale is superbly weighed, timed and choreographed. Here we encounter more phenomenal playing. This has a forbidding not to say oratorical power driven to the point of decay. I noted the merest touch of the tam-tam played piano at 9.10 - revel in it. This is wonderfully recorded both stunningly subtle and brazenly proud. Late Bernstein out-Bernsteined. The three early symphonies here in bright and eager performances are the more Kouchka-like of the six and therefore the least (mature) Tchaikovskian. The Second Symphony communicates very much in the Glazunov and Balakirev camp with a smashing finale from Temirkanov. The First is lightly painted and ingratiating. The Third includes a very stretched out Alla tedesca that may surprise if you know the symphony at all from other versions. This possibly mannered and sculpted approach also extends to the Capriccio Italien. Listen at 3.10 to the way he articulates the trumpet line note by note. This is unusual. Then again there is an understandable impatience about the storming and stomping rush at 12.40. He seems to want to get the big blowsy Neapolitan tune (12.50) out of the way with minimum delay. The Marche slave reeks of swagger and waxed moustaches as for that matter does the great march of the Pathétique. On the other hand the Swan Lake suite seems comparatively mainstream � and enjoyable although I missed the surprises and perhaps effrontery of the usual Temirkanov approach. The Francesca is almost too superheated. Listen at 21.15 to the brass statements stuttered out with such powerful emphasis. When the strings whirlwind at the end comes the orchestra play as if possessed by the devil called Legion who drove the Gadarene swine to their deaths. After this the classic Stokowski version seems almost serene. This version recalls for me the BBC broadcast performance by Yuri Ahronovitch and the LSO on 19 September 1978 - a withering performance which I hope will one day be issued on the BBC Legends series. The Manfred in the same Royal Festival Hall concert was equally outstanding - far superior to the densely lacklustre Manfred he recorded with the LSO on Deutsche Grammophon. This is a crowded field and few versions are weak. Jansons and the Oslo Phil have been a mainstream recommendation for years.Bernstein's six have been reissued by Sony at bargain price. You can still get my personal favourite: the 1960s Markevitch with the LSO on Philips. Svetlanov's six are intermittently to be found on BMG-Melodiya twofers. Pletnev and Muti have been highly praised in some quarters. This BMG set is highly personal, not bland, provocative and probably wrong-headed on some occasions. However one thing it will not do is allow your attention to drift. Temirkanov knows the latencies of this orchestra and the right spell to draw them out. He makes the RPO sound buzzingly idiomatic. If someone had told me that this was the one-time USSRSO, but for the recording dates, I would have believed them.